Camp Eggers is a fairly ordinary military base. The post exchange is open from 8 a.m. to 9 p.m. seven days a week, and the Green Beans Coffee shop 24 hours a day. You can also get a haircut from 8 a.m. to 8 p.m. seven days a week. Recreation services are open 24 hours a day, including phone/internet, library, a fitness center, television and game room, and movie/game rentals. Soldiers take classes at the education center in such subjects as American foreign policy. Lt. Santario Paris Stribling is even enrolled in an online college course in educational leadership, working toward his master's degree. It might be Fort Benning, Ga., Fort Sill, Okla., or any other U. S. mainland military base, but Camp Eggers is, in fact, located in Kabul, the capital city of Afghanistan. If there is any doubt in the minds of the men and women serving there, about why they are there, there is a reminder at the bottom of the compound Web page: "CLEAR ALL WEAPONS PROPERLY BEFORE ENTERING THE COMPOUND." 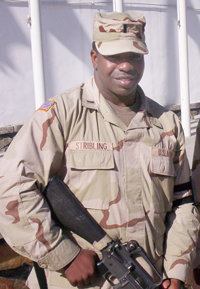 Lt. Santario "Sandy" Stribling may not be typical of the 16,700 U. S. men and women soldiers serving there. That number is no military secret, by the way. It's also posted on the Web site. But Sandy Stribling has not let the war in Afghanistan stop his progress toward becoming a better public school teacher and administrator. Stribling, 34, is from Mississippi, the son of two educators He was born when his father was serving in South Vietnam, and he joined the military when he was 17. After falling in love with Texas during his service at Fort Hood, he moved back to Mississippi just long enough to get his teaching degree from Mississippi State in 1998. 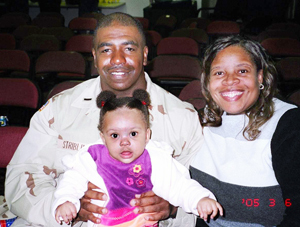 Lt. Stribling, daughter Sydney Nicole, and wife Rona. He returned to Texas to teach and coach at a middle school in Killeen, and joined the Texas National Guard, then took a job as a teacher and coach at a middle school in Pflugerville. In December 2001 he married Rona Parker, an electrical engineer. 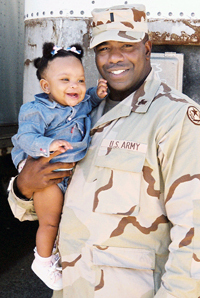 He enrolled in an educational administration master's degree program at Tarleton State University in January 2004, and in June, within a month of the birth of their first child, learned that his 111st Area Support Group National Guard unit from Austin would be sent to Afghanistan for a year. "I was upset that I was within 15 hours of an educational administration master's degree," said Stribling, "and now my education would have to be put on hold for a year." Stribling goes to the Camp Eggers gym a lot. His job there is MWR coordinator. He is responsible for morale, welfare and recreation--things that military personnel can do in their off time such as movies, bingo, dominoes, and working out. His typical workday, "if you don't count PT," is at the office from 0700 to 1800 (7 a.m. to 6 p.m.). Go to eat and more physical training, this time on his own. One day while he was at the gym someone suggested that he look into online courses. His adviser at Tarleton said he could transfer up to nine hours of academic credit--usually three courses. "Immediately I got on the Internet and found Sam Houston State University," he said. He signed up for courses during the first and second summer semesters, and will take another in the fall. Now each day after that second physical training session, he heads back to the office for a couple of hours in the online classroom. It makes for a long day. The actual lessons are pretty much what I expected," he said. "I put in more hours (as part of his unit duties) than I normally would back at home. But I expected that and am determined to do as well as I can." Fighting a war and at the same time continuing your education by Internet is a relatively new concept. But this is not your father's Combined Forces Command. The commanding officer is a lieutenant general named Karl Eikenberry. The command sergeant major is a tough old bird named Cynthia A. Pritchett. The media seems mostly negative. There are no Ernie Pyles in Afghanistan and Iraq. If you want a more positive picture of what is going on you can go directly to one of several of the military's own Web sites, such as the Kabul group's at http://www.cfc-a.centcom.mil/. Sandy Stribling has himself reflected on this changing military picture. "I think about that all the time," he said. "Actually my father, when I was born, was in Vietnam. I was six months old when he came back. "I think about the things he went through. I compare him to me and I know that he had it a lot worse, and here I am having the opportunity to further myself educationally in a war zone." Stribling is optimistic. He sees the increasing numbers of Afghanis being recruited for their newly-trained army. He believes that the U. S. operation known as Operation Enduring Freedom is accomplishing its mission of conducting humanitarian activities as well as combat, of establishing lasting security, of defeating Al Qaeda and its associated groups, and deterring the return of terrorism. "I think we are doing the right thing," he said. "The elections will be held this fall, and I think that is a good thing for the Afghani people, and I feel we are a big part of it." As for his future, he looks forward to returning next March. His wife is not working right now, so he can talk with her through the base-to-home telephone service almost any time. And these days, of course, there is the Internet. "My wife is from Houston," he said. "She's the breadwinner. One of the things we've considered is the possibility of moving to Houston." He's already checked into the Sam Houston State University doctorate in educational leadership, and thinks he would enjoy teaching in the area and learning more in a good old-fashioned classroom. "It looked like something I would be definitely interested in," he said.